I was just about to order GA but this post stopped me in my tracks. Why are you using Spring Effects & Damper Effects? anyone that has used a Logitech G25 or G27 for sims will probably know these effects are not true force feedback effects generated by the game but are fake effects generated by the Logitech software its self! & usually have quite an adverse feel to any real force feedback. 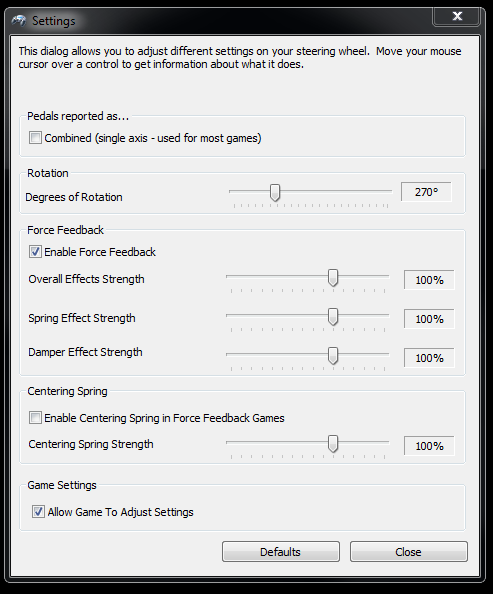 Games with proper force feedback usually recommend leaving these sliders at 0%. Are there any screen shots of the in game Force Feedback setup any where? I would really like to see what adjustments are available before deciding whether to buy GA or not. If anyone who has the game could post a screen shot from the game of the Force Feedback setup it would be much appreciated. I'm at work so I can't remember all my settings but I can say with my Logitech DFGT this is the best my wheel has ever felt in a racing game. What do steering saturation and steering linearity do? What's the difference in effects going from the lowest settings to the highest settings? I've noticed that the AI are able to use full-lock at high speed whereas with game controllers the game auto-adjusts the maximum steering angle at high speed to allow better car control, so obviously with a wheel I'd want to be able to use full-lock in the event that I hit them. However, not knowing what these settings do I don't know what I'd need to use to be able to do that. For my logitech profiler for the G27, I only have the Overall Effects to 100% and all the rest at 0, centered spring unchecked. This works out perfect with the ingame G27 settings at default. also 278 degrees of rotation. I have to say the Force Feedback is much better than it is in F1 2013, very nice! Anyone have T500rs settings they can share both software/game settings? I can't get anything to feel right with the wheel in this arcade game. I use g27 with Fanatec clubsport V2 pedals. Am I able to use these, another forum states that this game only supports one USB device. Nah i used my v2 pedal and T500RS (gt RIM) just fine. okay i will do! cant wait till i can race!!!! @Loore Can you post an explanation of what those settings actually do? Like Saturation and Linearity, I've never had a clear understanding of what they mean. I just tweak them one way and if it feels worse I tweak them the other way. It would be nice for future games if you can add a description of each setting in-game, that would really help. I asked this earlier in the thread and I got ignored. I'd like to know too. Linearity is like mouse acceleration - the further yo turn the wheel, the faster it increases... as it were. Sensitivty is just that... higher settings (lower Degree settings) are more sensitive and turn the wheels more for any amount of input. So, 220 degrees gives much more steering input, than a setting of 900 degrees. for Drifting you want a low setting.